Curb appeal is one of the most powerful traits that your home can possess. The way that visitors and neighbors perceive your home from the street dramatically influences their overall impression of you and your property. However, maintaining your curb appeal can sometimes feel overwhelming, especially if you are busy with other important responsibilities and don’t always have the time to maintain your landscaping. 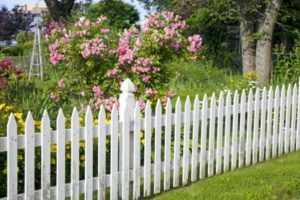 A fence is the perfect way to boost your curb appeal with minimal effort, and the following ideas might inspire you to invest in a fence of your own. A fence does not have to be tall or solid to serve its purpose. As long as you aren’t worried about your dog jumping over fence, you can enhance your home’s curb appeal with a simple decorative fence that stands just three to four feet off the ground. A white picket fence is the perfect example of a decorative fence that complements the style of the surrounding yard and lends additional appeal to the area. If white picket isn’t your favorite choice, you could opt instead for a decorative black metal fence with clever designs in between each post. The possibilities are truly endless. Any fence looks even better with beautiful flowers blooming around or on top of it. You can either build your fence within existing plants or add flowers and greenery after your fence has been installed. Either way, the effect will be eye catching to every person who walks by your house. Imagine colorful purple blossoms spilling over your picket fence and creating the ultimate focal point for your yard. Whether you select these ideas or any other fence style that inspires you, West Florida Fence in Tampa, Florida is the best company to turn to for the installation and maintenance of your new fence. Call (813) 251-5883 for a free estimate and start the process of enhancing your curb appeal to reach its true potential.